In this test a new two-story house built according to modern building codes is shaken using a recording of ground motion from the 1994 Northridge earthquake. The house survives the earthquake but the contence is severly damaged. House exterior 4.5 Mb MPEG The house survived the shaking. Bedroom 2.7 Mb MPEG Shelves collapse onto bed. Office/dining room 3.5 Mb MPEG Furnature toppels. 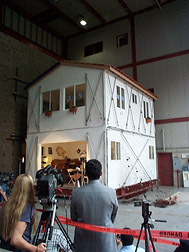 The video shows a two-story house being tested by a simulated earthquake on a shake table at the University of California at San Diego on July 11, 2000. The test matched-up very severe ground shaking with very strong construction. The goal was to verify that a new house that conforms to all building code regulations and in addition is specially engineered can escape with little damage from such an earthquake. The testing was part of the CUREE-Caltech Woodframe Project funded by the Federal Emergency Management Agency (FEMA) through a grant administered by the California Governors Office of Emergency Services. The earthquake shaking provided by the shake platform replayed the actual motion of the ground that occurred in an area where the shaking was most intense in the January 17, 1994 Northridge Earthquake (Los Angeles). The peak acceleration is about 1 g at the base, and the roof moved with an acceleration of over twice that. The precise record of the jolts, or accelerations, of the shaking in the Northridge Earthquake was obtained by a strong motion seismograph, and this computerized record was then played back on the shake table at UC San Diego the way a sound recording, when played on high-fidelity sound equipment, recreates very closely the original musical performance.